It seems everyone’s WhatsApp nowadays is suffocating under the weight of a long list of chats and groups. However it's not just your WhatsApp that has to deal with the side-effects occasioned by all these conversations. Your phone is also taking a hit storage-wise with all the hundreds of photos, gifs and videos that are constantly being shared each day. Fortunately for us, WhatsApp does actually provide us with means to curtail the accumulation of such media on our smartphones without having to take matters into our own hands. This involves either deleting or clearing chats. There however seems to be confusion between what these two do. Clearing a chat - will delete all the messages, group conversations and any media in that chat but it will NOT remove that chat from your list of chats or exit you from a group. Deleting a chat - will delete all the messages, group conversations and the media but that chat will no longer be available in your chat list. 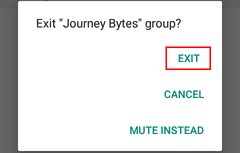 For groups, you'll be required to exit them before you can delete them. In both options, you're given the choice to delete the media as well. As such we can use either of these methods to delete all the media for a specific chat. However if you need to remain in a group you should only use the clear chat option. With individual chats you can use either since you can start a new conversation any time as long as that person is in your contact list. Let's take a look on how to use either of these methods to delete all the media in WhatsApp for Android. 1. 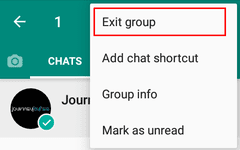 On the WhatsApp chat list page, open the individual chat or group whose media you want to delete. 2. Once inside the chat, press your menu button or tap on the three vertical dots on the top right of the screen to reveal the menu. 3. From here, go to More then tap on the Clear chat option. 4. You'll get a prompt asking you to confirm the clearing. Just below this message leave the "Delete media from my phone" option checked then tap on the CLEAR button. Doing that will clear all the messages along with all the media of that particular chat. All media will also be deleted from your phone's storage. 1. On the WhatsApp chat list page, long press on the chat you want to delete then tap on the delete icon at the top. 2. You'll get a prompt asking you to confirm the deletion. Below it leave the option "Delete media from my phone" checked then tap on the DELETE button. As mentioned earlier, to delete a group will require you to exit that group first. 1. 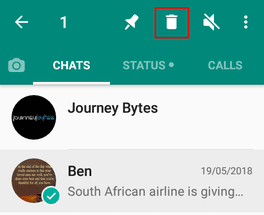 On the WhatsApp chat list page, long press the group whose media you want to delete then tap on the three vertical dots to reveal the menu. Tap on the Exit group option. 2. You'll then get a confirmation prompt. Tap on the EXIT button to leave the group. 3. Doing that will display a message that you've left from that group. Long press on the chat again then at the top tap on the delete icon. 4. You'll get a prompt asking you to confirm the deletion. Below it leave the option "Delete media from my phone" checked then tap on the DELETE button. This does NOT delete the media permanently. The media is only deleted for you (and in your phone) and therefore will still be available to the contacts you were chatting with or other members if it was a group. Still, it's not possible to redownload old messages or the deleted media even if you just cleared the chats. 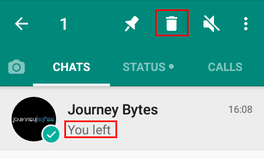 It's possible to delete all the media for specific chats and keep their messages or group conversations. You also don't have to exit a group to delete their media. To do this we however we don't use the clear or delete options. You may also want to delete a specific media type of a particular individual or group chat instead of having to delete everything. Perhaps you want to delete the videos but keep your images and animated gifs. Or perhaps you want to delete everything save for documents or audio messages. Likewise, this is possible by deleting the media through the Data and storage usage settings as I've outlined here.